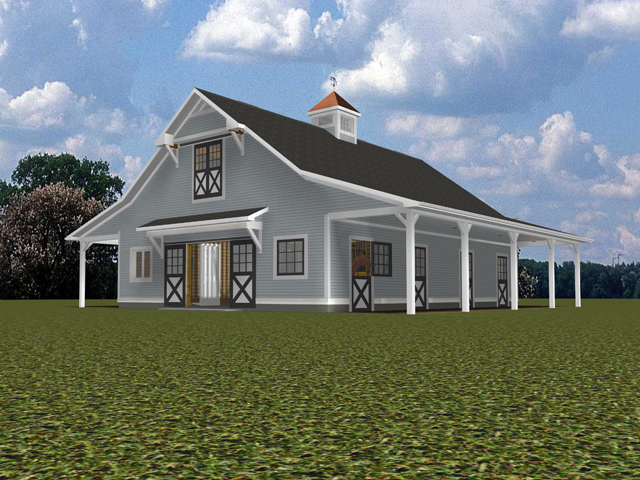 Here is a barn with the features most commonly requested. Included are 5 stalls, two of which are 14' wide, a Center Aisle, Wash Stall, Tack Room and Grain Room. Also there is a internal set of Stairs that provide access to the Second Floor Loft. Good looking yet extremely practical, the design intent with this structure was to provide the efficiency necessary for those with a life beyond the barn. Easily expanded to 7, 9 or more stalls. Give Karl a call. He would be happy to come to your Aiken location and show you this plan and others, or discuss your own ideas for a new custom home.